Tunisia needs new legislation to restrain use of firearms by police and other law enforcement agencies to comply with international law. 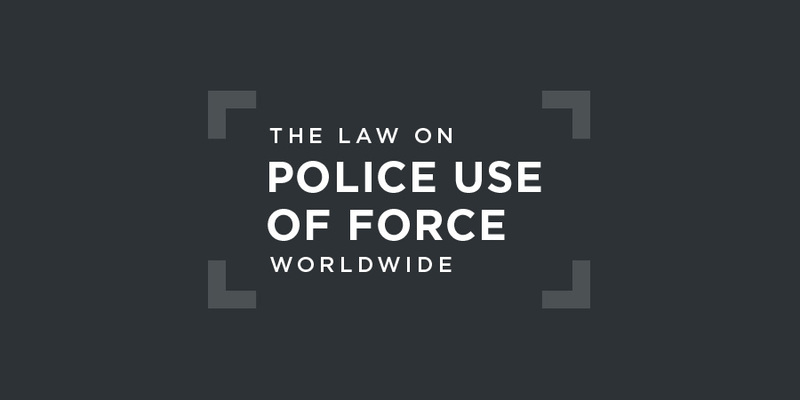 International law restricts use to where it is necessary to confront an imminent threat of death or serious injury or a grave and proximate threat to life. According to Tunisia's 2014 Constitution, the right to life "is sacred and cannot be prejudiced except in exceptional cases regulated by law".Article 22, 2014 Constitution of Tunisia.It is further stipulated that the state "protects human dignity and physical integrity, and prohibits mental and physical torture".Article 23, 2014 Constitution of Tunisia.Every prisoner has "the right to humane treatment that preserves their dignity".Article 30, 2014 Constitution of Tunisia.The right to "assembly and peaceful demonstration is guaranteed" under the Constitution.Article 37, 2014 Constitution of Tunisia. has served in practice as a means by which the police can arrest individuals—some of whom ended up being prosecuted and imprisoned—merely for arguing with police, being slow to heed orders, or were suspected when they filed a complaint of being likely to file a complaint against police. Earlier repressive laws also remain in force, despite calls for their revision, such as Law No. 69-4 of 24 January 1969 regulating assemblies. Despite the constitutional right of peaceful assembly, according to this law, if police officers call for the dispersal of a crowd and the demonstrators do not comply, the police are authorised to, progressively, use water cannon or baton charges; fire tear gas; use firearms to fire warning shots in the air; fire warning shots above the heads of the demonstrators; and then fire at their legs.Chap. IV (Use of Weapons), Art. 21, Law No. 69-4 of 24 January 1969 regulating public meetings, processions, marches, demonstrations, and crowds. According to the Penal Code, any public official who, in the exercise of his functions, without legitimate justification, uses or causes the use of violence towards others shall be liable to five years' imprisonment and a fine of 120 dinars.Art. 101, 2012 Penal Code (unofficial translation).In addition, any public official who, in the exercise of his functions, inflicts torture on another shall be liable to eight years' imprisonment.Art. 101bis, 2012 Penal Code (unofficial translation). In 2016, the UN Committee on Enforced Disappearance expressed its concern about Law No. 22/2015 on the fight against terrorism, which does not guarantee access to a lawyer or relatives during the custody period. This can allow the police to hold suspected terrorists in incommunicado detention for up to fifteen days, with a prosecutor’s consent after the fifth day.Committee on Enforced Disappearance, Concluding Observations on Tunisia's national report, UN doc. CED/C/TUN/CO/1, 25 May 2016, §29. The National Assembly passed legislation in 2013 to create the National Body for the Prevention of Torture. Its duties include periodically inspecting detention facilities for evidence of torture or other inhumane treatment or punishment. The Assembly also passed legislation in December 2013 to create the Truth and Dignity Commission, whose task is to investigate human rights violations occurring between 1 July 1955 and the end of 2013. It was established for a four-year period with an option for a one-year renewal, although this option was not taken up and, as of writing (February 2018), the Commission had still to deliver its final report. In 2016, the UN Committee against Torture published its Concluding Observations on Tunisia's third periodic report under the 1984 Convention against Torture. It stated that:UN Committee against Torture, Concluding Observations on Tunisia's third periodic report, UN doc. CAT/C/TUN/CO/3, 10 June 2016, §15. The Committee called on Tunisia to:UN Committee against Torture, Concluding Observations on Tunisia's third periodic report, UN doc. CAT/C/TUN/CO/3, 10 June 2016, §20(a). It further called on Tunisia to ensure "the impartiality of inquiries conducted by the police, for example by transferring the judicial police service to the Ministry of Justice" and "that persons suspected of torture or ill-treatment are immediately suspended from duty for the duration of the investigation, particularly when there is a risk that they might otherwise be in a position to repeat the alleged act, to take reprisals against the presumed victim or to obstruct the investigation".UN Committee against Torture, Concluding Observations on Tunisia's third periodic report, UN doc. CAT/C/TUN/CO/3, 10 June 2016, §20(c) and (d). A number of individual complaints have been made to the Committee against Torture on the behaviour of the Tunisian security and prison services. In a decision published in October 2017, the Committee found that Rached Jaïdane, a Tunisian national born on 25 March 1963 in Tunis, had indeed been the victim of acts of torture lasting seventeen hours during his detention at the hands of the security services for alleged terrorist activities and subsequently during his detention for a further twenty days. At his trial, he was convicted and sentenced to 26 years in prison. The complaint affirmed that:Committee against Torture, Decision adopted by the Committee under article 22 of the Convention, concerning communication No. 654/2015, UN doc. CAT/C/61/D/654/2015, 3 October 2017, §2.18. Rached Jaïdane was released in February 2006 after 13 years of torture and ill-treatment in Tunisian prisons. He continues to suffer severe physical and psychological after-effects of the torture, which have entailed a disability rate of 35 per cent. He suffers, among other after-effects, from an implosion of the right eye, a deviation of the nasal pyramid, buzzing in the ears, positional vertigo, multiple dental fractures, aggravation of a hernia and a varicocele, and post-traumatic neurosis.... Rached Jaïdane is unable to father a child because of several of these pathologies. Based on the circumstances and the available evidence, the Committee concluded that "the complainant’s allegations must be taken fully into account; that the abuse to which he was subjected was perpetrated by officials of the State party in an official capacity; and that the acts in question constitute acts of torture within the meaning of article 1 of the Convention".Committee against Torture, Decision adopted by the Committee under article 22 of the Convention, concerning communication No. 654/2015, UN doc. CAT/C/61/D/654/2015, 3 October 2017, §7.4. Figures provided by the Tunisian government in Tunisia’s third periodic report to the UN Committee against Torture indicated that of 230 cases of excessive use of force by the security forces heard by courts between 1 January and 1 July 2014, six were dismissed for lack of evidence or on other legal grounds, three resulted in prison sentences and fines in absentia, two in suspended prison sentences, and twenty cases were transferred to the Permanent Military Court in Tunis. The remaining 165 cases were still under investigation at the time the report was written.Committee against Torture, Third periodic report of Tunisia, Addendum, Additional updated report, 13 October 2014.